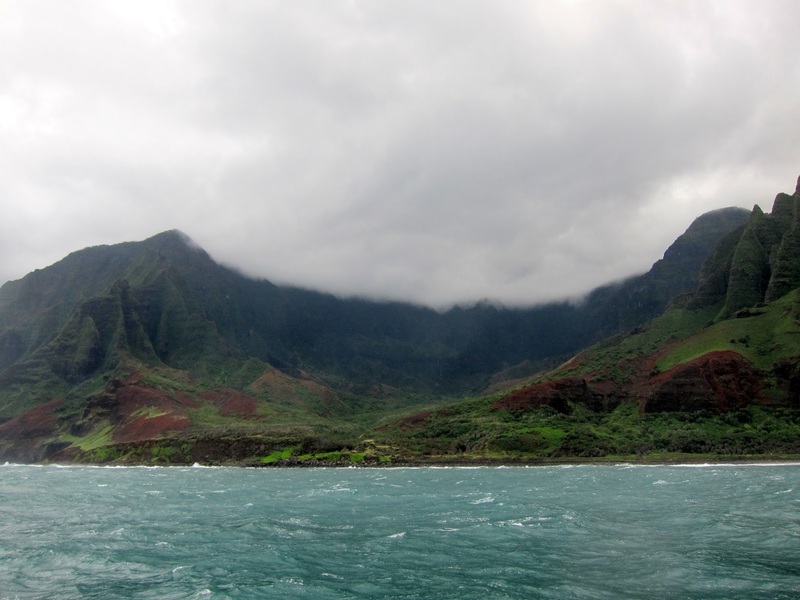 While we had almost constant sun in Oahu, we were greeted with overcast skies on Saturday as we landed on the island of Kauai. Picking up our rental car, Tori and I passed through the eucalyptus Tree Tunnel of Maluhia Road on our drive down to the South Shore. Reaching the town of Poipu, we checked into our condo at the Outrigger Kiahuna Plantation Resort. 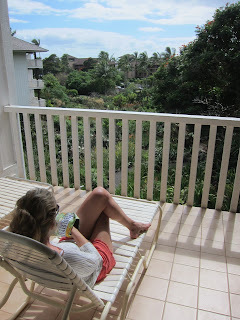 We didn't have an ocean-view but we had a native botanical garden below our balcony. We made the short walk to the sandy curve of Kiahuna Beach fronting the resort where the sun peaked through a long streak of blue sky over the ocean. Because it was our honeymoon, the nice employee at the beach hut gave us snorkels, masks and fins for free. Across the road in the Poipu Shopping Village, we ate lunch at Tropical Burgers and stopped for a Puka Shave Ice. We shared a half-and-half cup of Lilikoi (Passion Fuit) and Li Hing Mui (Salty Dried Plum). 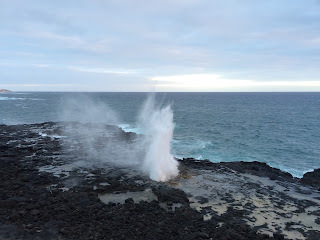 After relaxing for awhile, we drove down the coast to check out the blowhole at Spouting Horn Park and watch the sunset. (It was also our first encounter with the countless roosters of the island.) 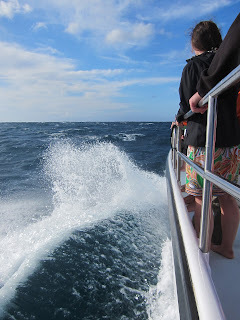 From the windy overlook, we watched the swells pound into the reef and spray water over thirty feet into the air. When the blowhole calmed down a bit, we crossed out onto the volcanic shelf and I approached the gasping mouth to take a closer look between the powerful blasts. Back at the condo, we ended the evening with a bottle of wine. 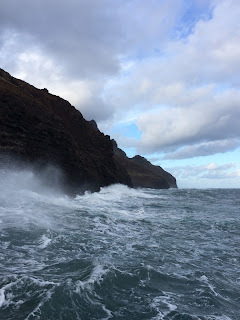 Due to huge swells, our catamaran trip to the Na Pali Coast was postponed until Tuesday so we decided to visit the "Grand Canyon of the Pacific" instead. 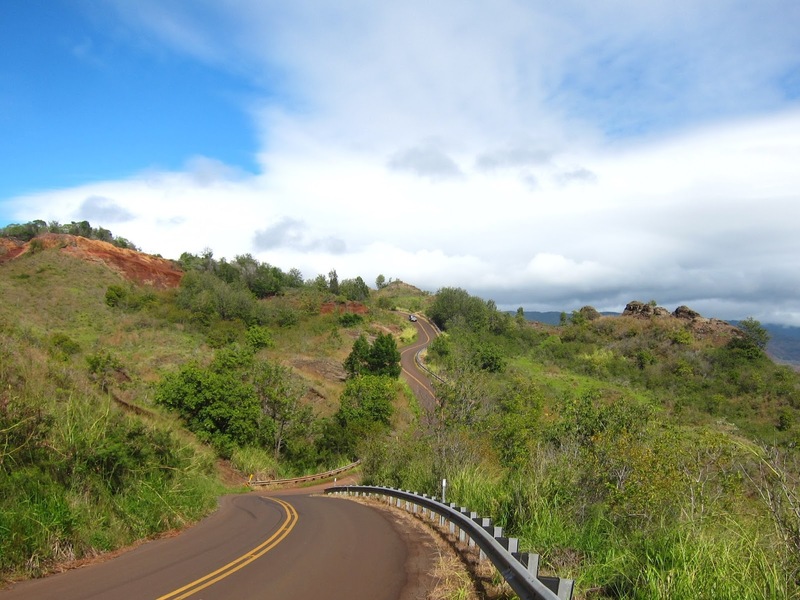 After a Sunday Brunch at La Spezia Restaurant in Old Koloa Town, we headed down the coast and turned onto Highway 550 winding up the western rim of Waimea Canyon. At several turnouts, we stopped to stare out over the bright greens and deep reds of the high cliffs. 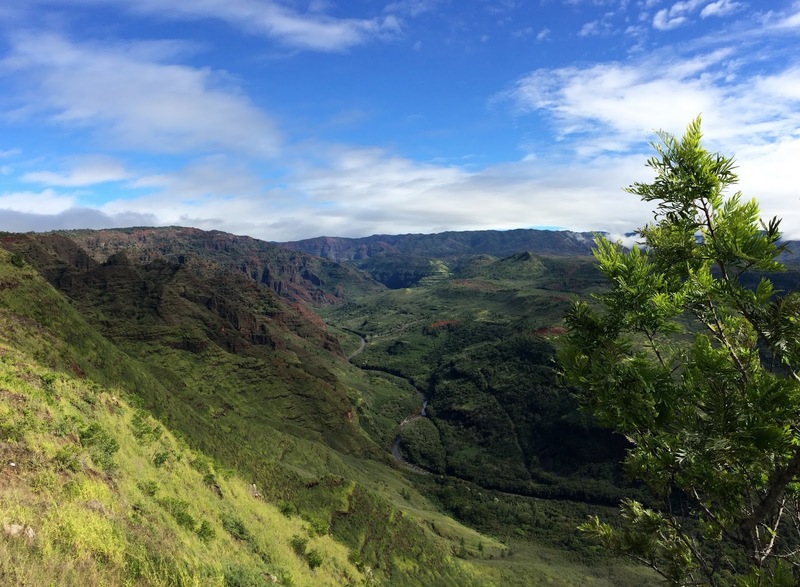 Draining one of the wettest spots on earth, the Waimea River has carved out a canyon 14 miles long, 1 mile wide and 3,600 feet deep. 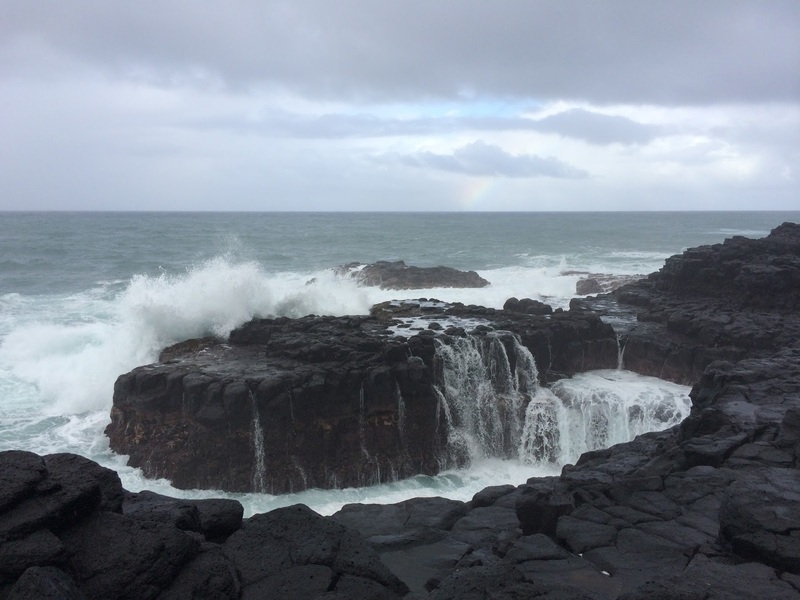 The parking lot for the official lookout was full of tour buses checking out Waipo'o Falls (800 feet) visible on the far side while a faint rainbow descended into the misty gorge. We stopped for a closer view of the falls at the Pu'u Ka Pele Lookout near Mile 13 Marker. The mist coalesced into drizzle against our windscreen as we continued up into Koke'e Park. 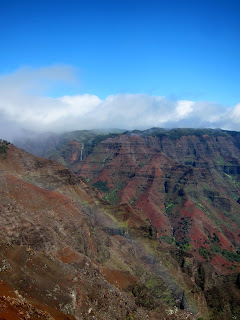 We were eager to see the famous Kalalau Valley that descends down to the Na Pali coastline but the view at the lookout was completely whited out beyond the rail. Continuing to the end of the paved road, we had the same dismal view at the Pu'u o Kila Lookout where we parked to hike the Pihea Trail. The shrouded valley taunted us as the path followed the rim through tropical rain forest. 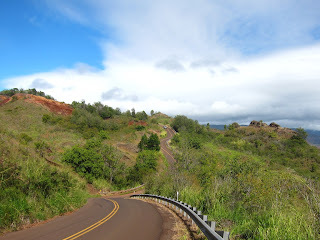 While fairly dry at the beginning, the soil grew slippery and muddy as we neared the crossroads to the Pihea Vista Overlook. A few of the swampiest spots had wooden boardwalks, but we needed our hands to grab any exposed tree branch or root to help climb the steep ascent to the overlook at 4,284 feet. It was a bit freaky standing on spongy ground overhanging a shear drop into the misty abyss. I don't think I could have stood so close to the edge with clear visibility. Returning to the crossroads, we could have continued on through the bogs of the Alaka'i Swamp, but we didn't want to risk the long hike if the views of the Wainiha and Hanalei Valleys at the far end were obscured as well. Hiking the 2 miles back to our car, I gave up trying to keep my shoes as clean as possible from the colorful mud. My socks are still stained red after several washes. Driving back down the Waimea Canyon to the sunny southern coastline, a striking stretch of landscape caught our attention on the side of the road, the unique Red Dirt Falls. 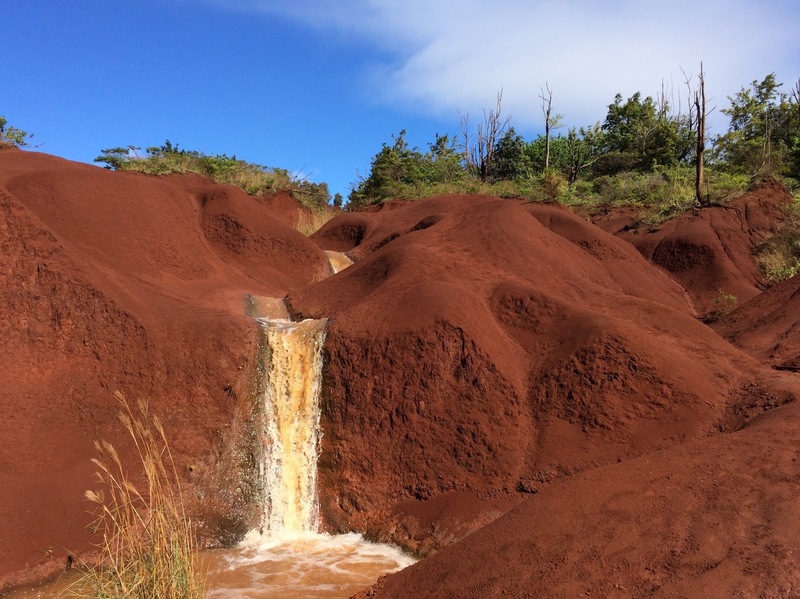 Against a contrasting backdrop of deep blue skies and lush green trees, a small stream wound through the bright red hills and dropped over a miniature waterfall. Walking on the red soil, I expected to see the Mars Rover trundling about. The unique environment also drew a photographer and a couple of models to do a fashion shoot at the same spot. 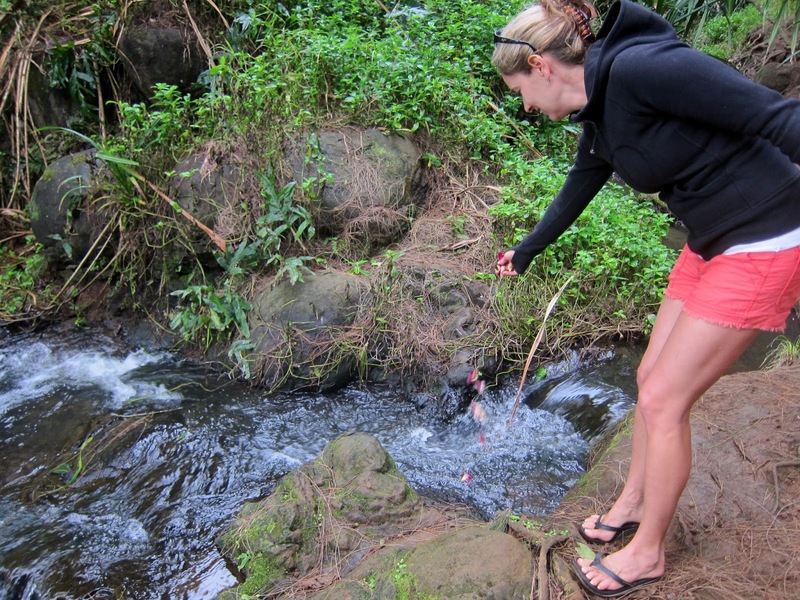 While trying to rinse the mud off her shoes from the earlier hike, Tori slipped into the narrow stream below the falls and soaked them completely. Starving by the time we made it back down to the town of Waimea, we stopped for food at Island Taco. The giant tacos were delicious! (Waimea is the spot where Captain Cook first made landfall after he discovered the Hawaiian Islands.) 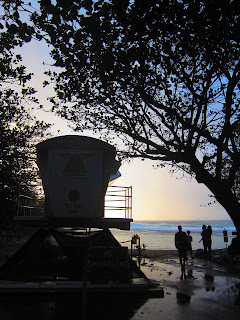 Heading west, we parked at sunny Kekaha Beach for awhile and watched the local surfers catching some great waves. On the drive back to Poipu, we pulled into the factory store of the Kauai Kookie Company in Hanapepe. They had lots of free samples and we ended up buying 10 boxes. 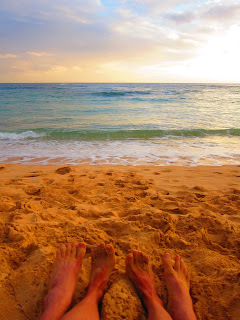 It was still sunny by the time we got home so we walked down to Kiahuna Beach to swim and wash off the last traces of red mud. The sunset was gorgeous! For dinner, we crossed Poipu Road to eat at Keoki's Paradise, a fun touristy restaurant with a tropical theme. It was crowded but we got a table in the bar within ten minutes. Tori loved the Thai Shrimp and Green Papaya Salad with the Fresh Lime Vinaigrette. I had the Holua Sliders (Cheeseburger, BBQ Kalua Pork and Crab Cake Sliders) which were decent but the Maui Onion Soup was amazing, their island version of French Onion Soup with Sweet Onions. (More Blue Hawaiians!) 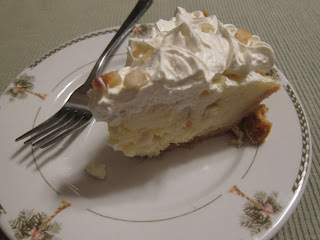 For desert, we shared a huge slice of Kimo’s Original Hula Pie made with Macadamia Nut Ice Cream. I was so full! For Monday, we didn't have any big plans except to explore the area around Poipu. 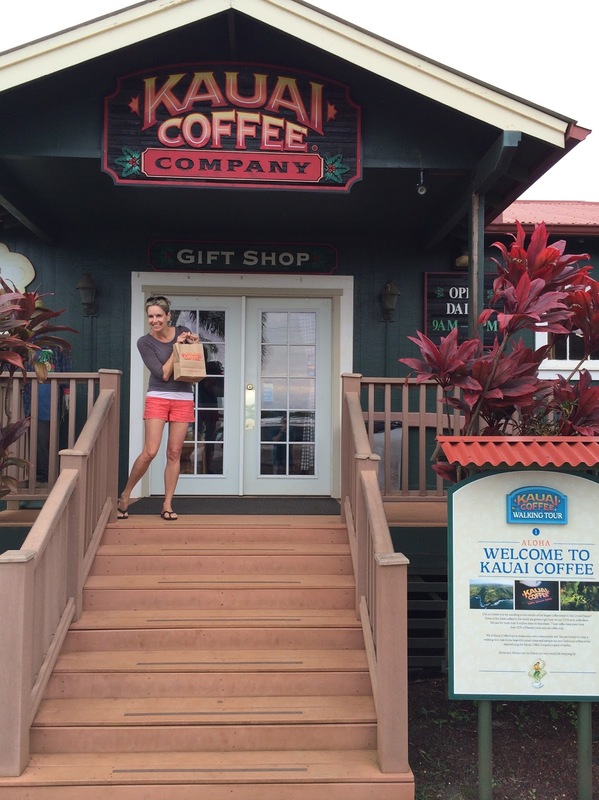 We started off with breakfast sandwiches over at the Koloa Deli where a group of local old-timers sat on the outside deck drinking coffee and greeting everybody who passed. 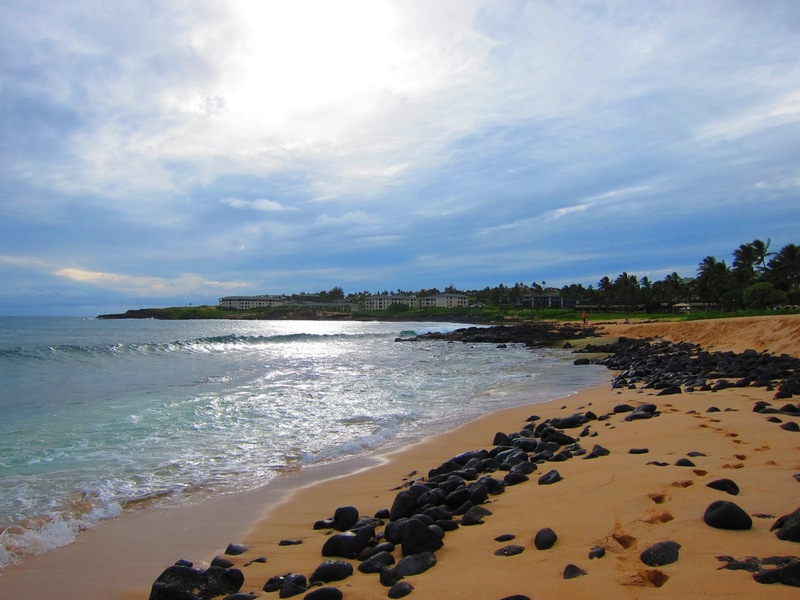 It was an overcast day as we walked past the Sheraton Kauai Resort from Kiahuna Beach to Koloa Landing Cove where the scuba divers entered the water. We continued on to The Shops at Kukuiula where we got some ice-cream at Lappert's before heading back. 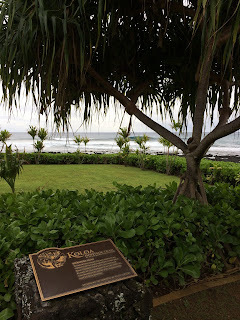 In the other direction, we walked past our beach towards the Ko'a Kea Hotel and the Marriott's Waiohai Beach Club. Just inside the resort was a hedged-off section that contained the ancient site of the Kihahouna Heiau where a walled temple for several Hawaiian gods once stood. The sacred spot was Kapu, forbidden to enter. 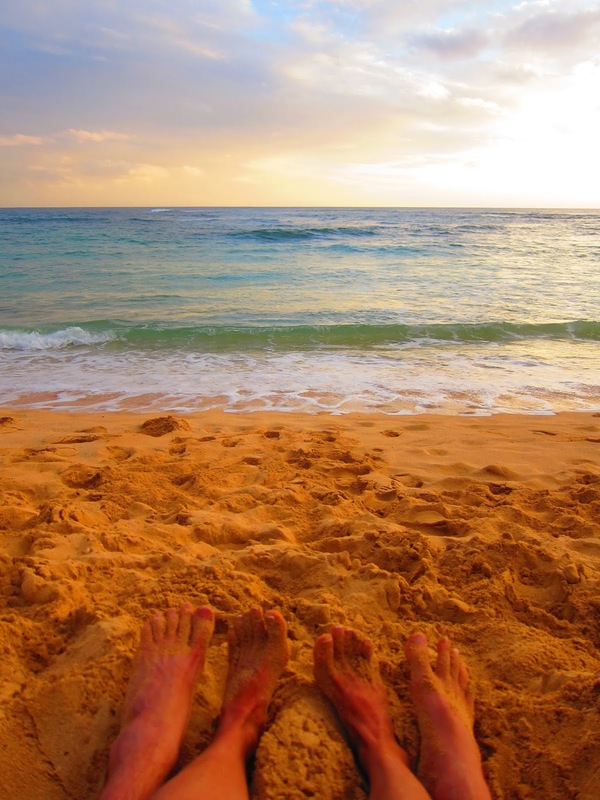 Past the Marriot, we strolled out on the thin spit of sand that connected to the outer reef at Poipu Beach Park. We looked for Monk Seals at Brennecke Beach but we didn't see any. For lunch, we went to Puka Dog for their famous Hawaiian-style hot dogs encased in a circular bun with sweet tropical relishes. The tiny restaurant had a huge line out the door due to the arrival of several tour buses but the wait was worth it. I ordered the Polish Sausage with their Spicy Garlic-Lemon Secret Sauce, Lilikoi Hawaiian Mustard and Pineapple Relish. Tori really enjoyed the Veggie Dog and the fresh-squeezed lemonade. 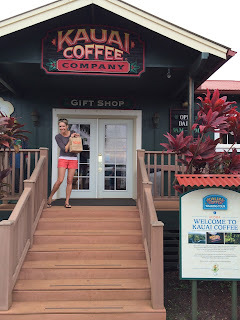 Driving to Kalaheo for one of my wife's favorite passions, we passed through the state's largest coffee plantation to arrive at visitor center of the Kauai Coffee Company. We sampled several of their brews (strong and dark for her and sweet and flavorful for me) and took the self tour through their coffee trees during a light rainfall. 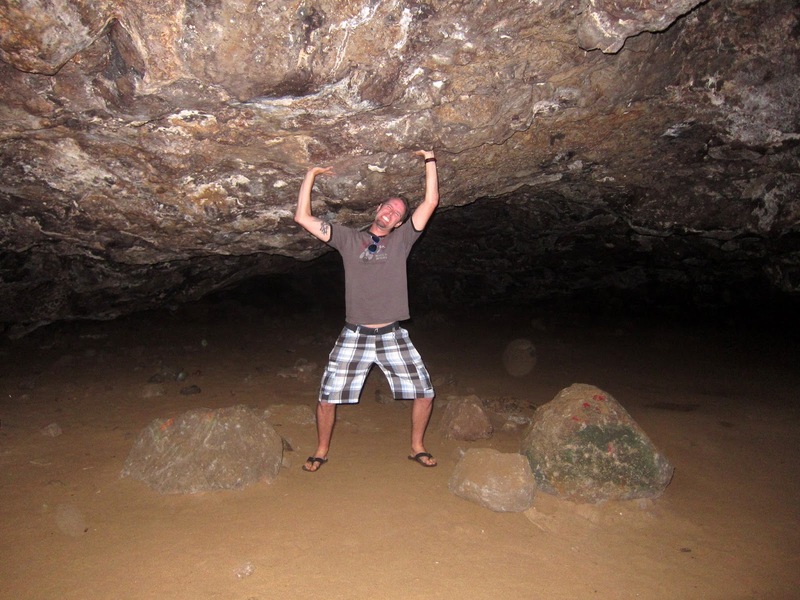 Back in Poipu, we drove to Shipwreck Beach at the end of the paved road. The Mahaulepu Heritage Trail begins at the west end of the beach and leads to the top of the Lithified Sand Dune Cliffs overlooking Keoneloa Bay. 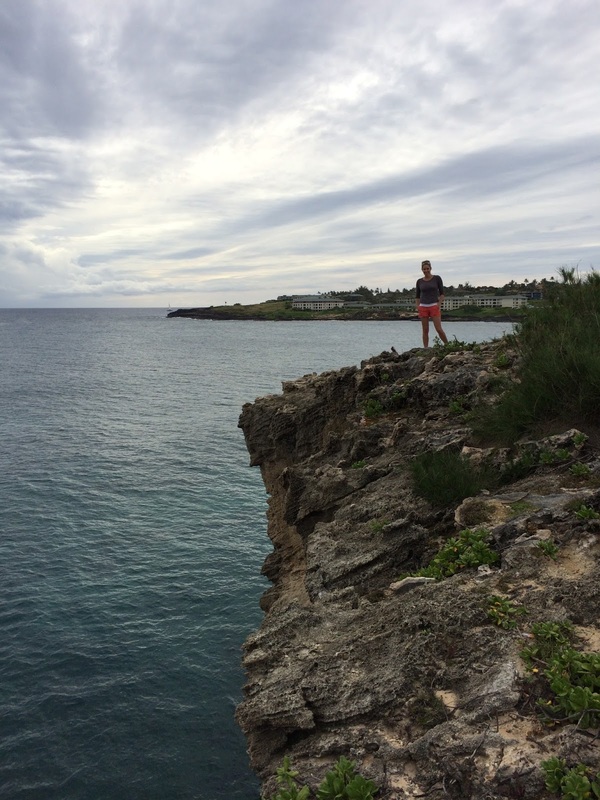 Peering over the cliff's edge, we could spot several huge sea turtles (Honu) swimming in the ocean below. 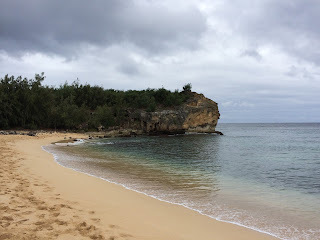 We followed the trail along the ridge of limestone formations and around rocky inlets filled with tidepools to the Paa Dunes. Beyond the pinnacles, we could see Punahoa Point across the bay before we turned around to head back. Back at Shipwreck's, we walked around the Saltwater Lagoon Pool inside the Grand Hyatt Kauai Resort before heading back home for dinner. Since Tori had been craving the Ahi Poke Tower she had seen at Keoki's Paradise the night before, we went there again. It was so delicious that she doubled up on the fish and ordered the Asian Seared Ahi for her entree while I had Filet Mignon. 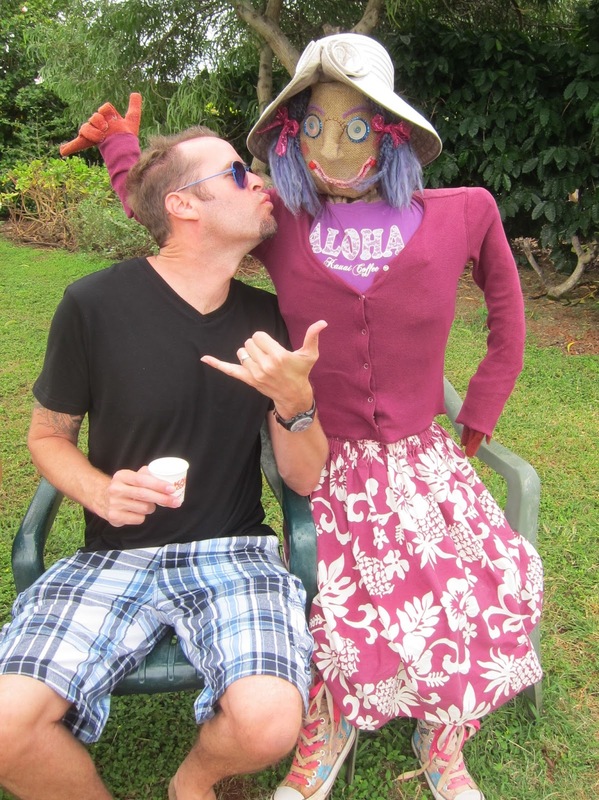 This was my wife's favorite restaurant in Hawaii. 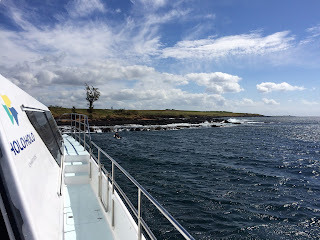 Since our catamaran trip to the Napali Coast had been postponed from Sunday, Holo Holo Charters upgraded us to their Super Tour that included the Forbidden Island of Niihau. This meant we had to wake up earlier on Tuesday morning to reach Port Allen by 6am. 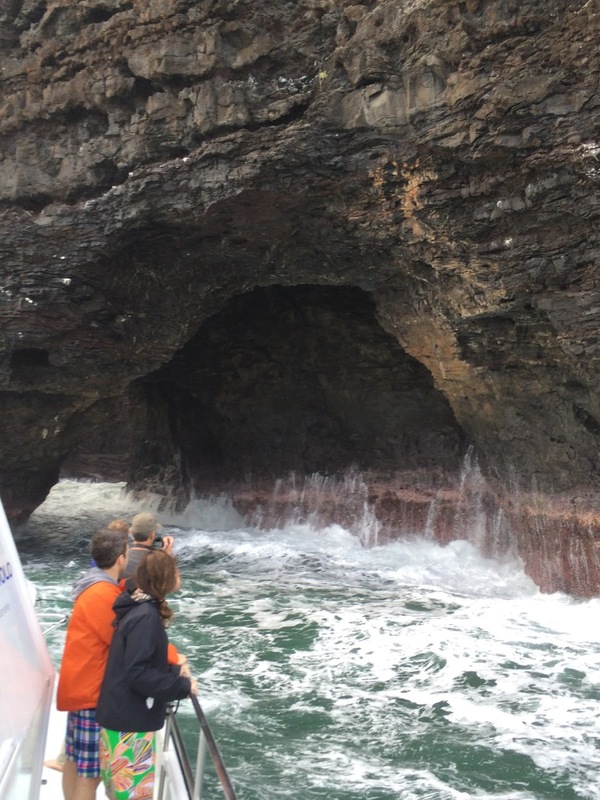 During the morning briefing, the Captain warned us of the "exciting" conditions (i.e. 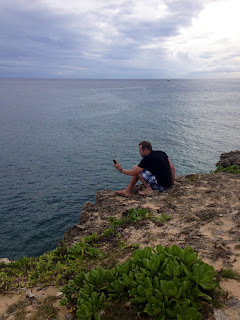 rough) on the windward side of the island and gave everyone a last chance to back out. 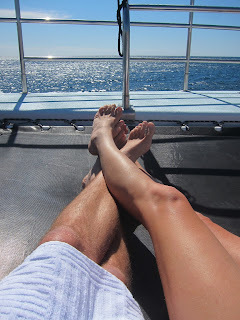 Trusting our Dramamine, we boarded the power catamaran in the dark. 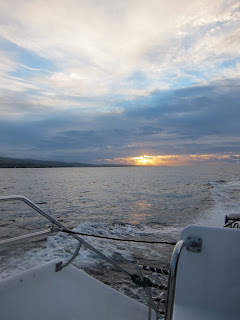 Cruising along the South Shore, we ate a nice breakfast and watched the sun rise behind our wake. 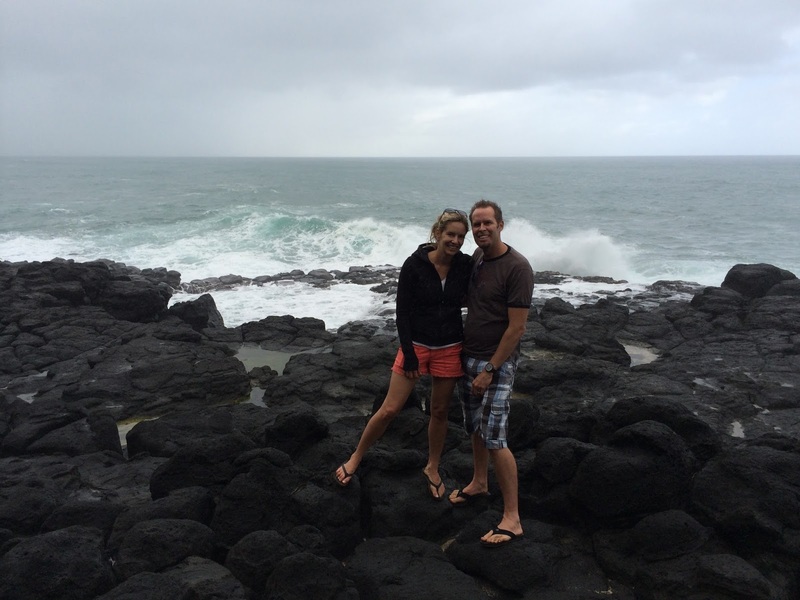 The ocean soon grew exciting as we rounded the Barking Sands Pacific Missile Range Facility and Polohale State Park. 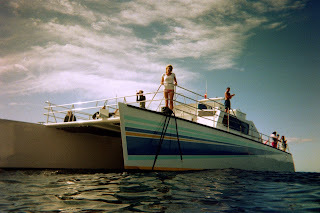 Tori and I sat inside, out of the cold spray, as large swells smacked against the double hulls as we powered up the Napali Coast. I started to feel a little squeamish but I remained okay as long as I concentrated on the horizon through the large windows. The boat's powerful engines slowed as the tall Napali cliffs opened out into the Kalalau Valley in front of us. While the steep-walled canyon had been whited out from the upper rim on our Sunday hike, we could now see into it from below. Idling slowly back down the coast, heaving swells rocked our catamaran while the Captain described the landscape. He had an excellent handle on the craft as he brought it right up to an arch in the cliff face where waves crashed into the Open Ceiling Cave. Standing on the tossing deck while looking at the viewscreen of my small camera proved to be my undoing. 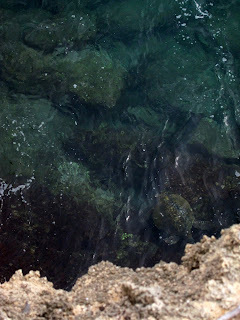 My Dramamine admitted defeat as I rushed to the back and fed the sea turtles over the rail. 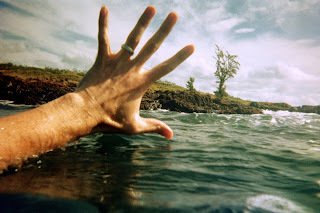 Observing the conditions, the Captain decided against crossing the channel to snorkel at the Forbidden Island of Niihau. As we picked up speed and cruised south with the movement of the swells, I felt much better. 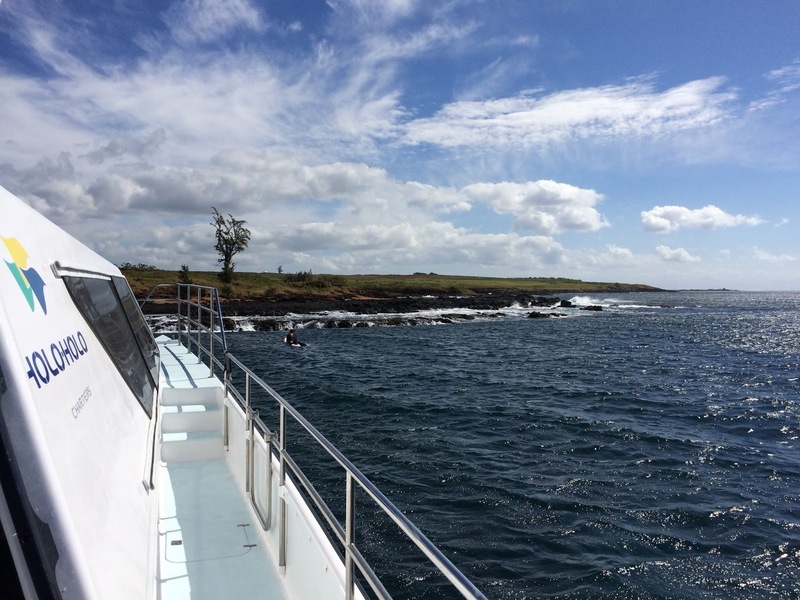 Back on the leeward side of the island, the catamaran anchored in a small cove at Kaumakani Point for snorkeling. Inland, we could see the Olokele Sugar Mill which ended operations in 2009, the last active mill on Kauai. 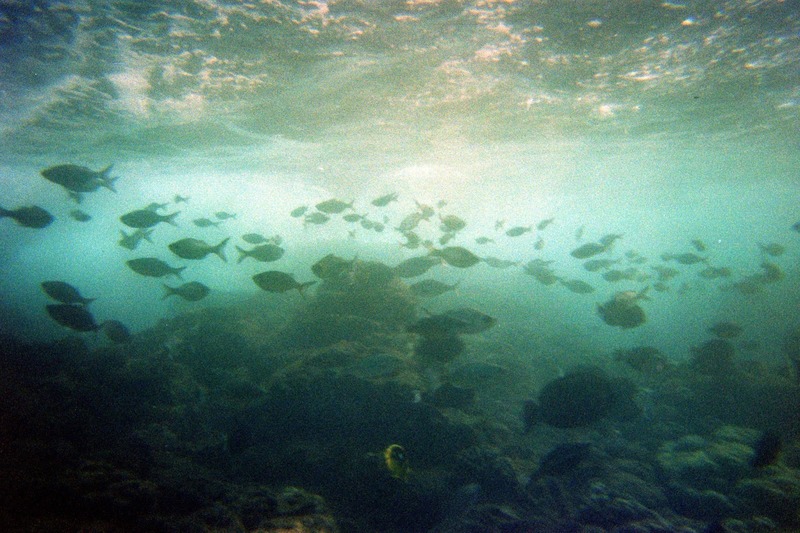 My wife stayed on board while I went into the water and swam among the tropical fish schooling along the rocky point. I took a picture of a four-foot long Trumpet Fish but it didn't come out very well. 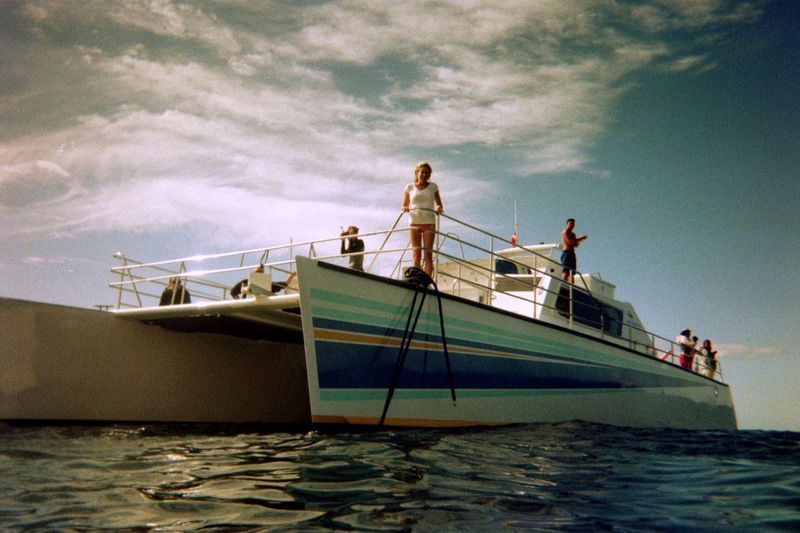 I was starving after snorkeling so I ate two of the deli sandwiches while I relaxed with Tori on the forward net. We saw several turtles swimming around the boat. Since our tour ended at 2, we went to the beach in front of our condo for the rest of the afternoon where I went snorkeling again. I took the waterproof fish identifier with me and I spotted the Moorish Idol, Unicorn Fish, Needle Fish and the Sergeant Major as well as the Rectangular Triggerfish (Hawaiian State Fish). 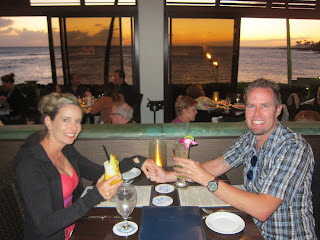 For dinner, we drove down to the Beach House Restaurant for a romantic meal. The sunset view was amazing. Tori ordered fish while I had the chicken. 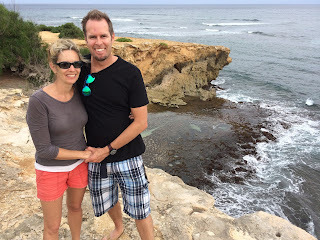 For our last full day on the island, we decided to drive around the leeward side of the island to the North Shore. After breakfast at Tropical Burgers (Frosted Flake French Toast - Yum!) and quick stops at Starbucks and a gas station to put air in a low tire, we headed off to see the Wailua Falls near Lihue. The 80-foot twin falls, featured in the credits of Fantasy Island, are impressive but we didn't stay for long due to the heavy rain at the lookout. 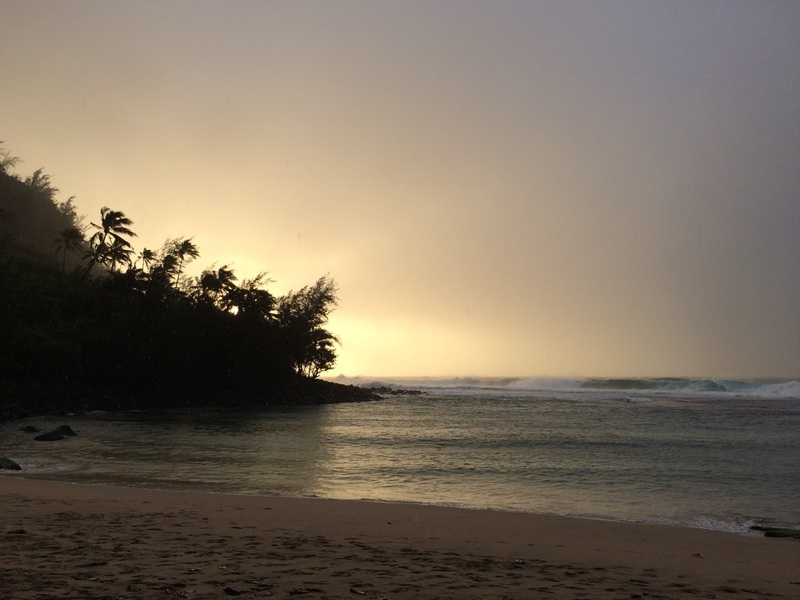 The sun came out as we drove through Kapa'a on the Coconut Coast. I think I would prefer the vibe of this hippyish town over the more resort feel of Poipu if I came to Kauai again in the future. 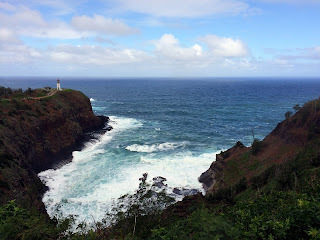 As we reached the North Shore, we made a short detour to see the Kilauea Lighthouse that sits on the northernmost point of the Hawaiian Islands before heading on to meet friends at Princeville. Meeting up with Blayne, Carrie and Corine at the shopping center on the outskirts of Princeville, we drove inside the planned community surrounding a golf course to have cocktails at the St. Regis luxury hotel. I didn't care much for the lifeless cookie-cutter neighborhood surrounding it, but the view of Hanelei Bay from the hotel's tiered balconies was impressive. It began to rain again as we took the elevator's down to the large uncrowded pool area where we had drinks at the outdoor bar while a hungry bird hopped around the counter. We then all drove over to the small parking lot at the top of the trail down to the Queen's Bath where Tori tossed some of the flowers from our wedding leis into the waterfall halfway down. 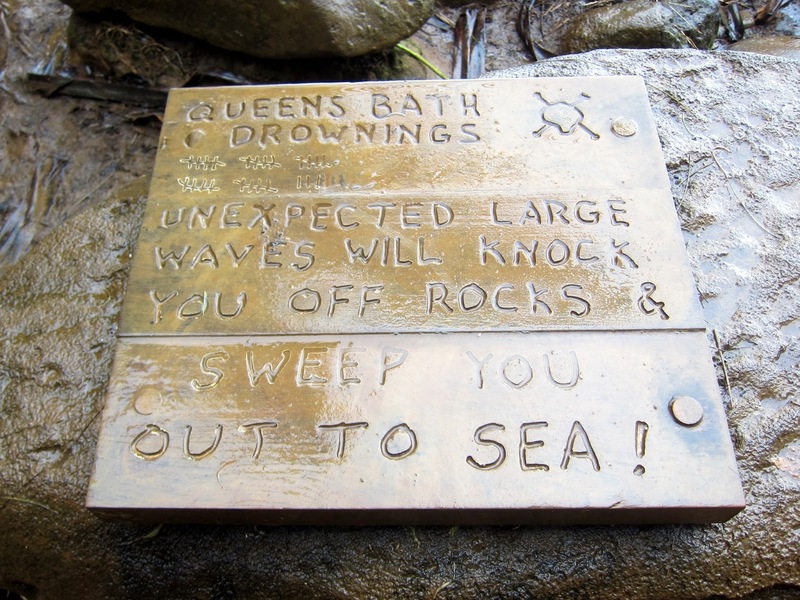 A homemade sign at the beach entrance warned visitors of rogue winter waves dragging people off the rocks and out to sea. During the summer, the calmer ocean allows bathers to relax in the Queen's Bath, but we kept a respectful distance from the small pool deluged with heavy waves crashing onto the volcanic coastline. During a brief period of calm between waves, Tori threw the rest of the flowers into the ocean before we headed back up to get out of the heavy rain. Parting ways from our friends, we continued on the Kuhio Highway to the Hanalei Valley Lookout where we enjoyed the view of the picturesque farmland below as we ate a snack. Further along the highway, we had to wait to cross several of the single lane bridges as we explored the many beaches. 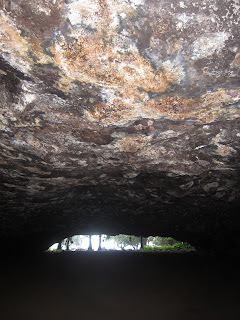 Parking at Hanelei Beach, we walked deep inside the Maniniholo Dry Cave. 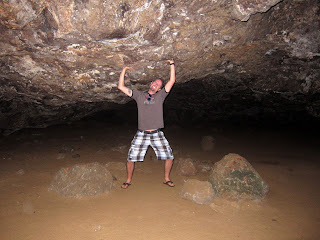 The sandy floor sloped several hundred feet into the darkness until the entrance was only a thin line of light behind us. At the end of the road, we reached Ke'e Beach just in time to watch the sunset in the rain. The beach is also the beginning of the 11 mile Kalalau Trail that traverses the treacherous cliffs of the Na Pali Coast until it reaches the Kalalau Valley that we saw from our catamaran trip. Heading back towards Blayne and Carrie's rental house for dinner, we passed Haena Beach where we saw brave surfers riding huge well-formed waves close to shore. We didn't have far to drive from Ke'e Beach before we arrived at their beautiful rental in Ha'ena. Raised high off the ground, the home had a single continuous balcony circling the entire floor. Their neighbor, Bruce, had invited them over for dinner so we joined them with some of his local friends. We enjoyed the ahi and sushi as we listened to the locals discuss life on the North Shore. It was interesting to hear them complain about the buildup of the area and the heavy tourist traffic clogging the single lane highway. We heard about living with tidal wave evacuation warnings and the frequent drowning deaths on the nearby beaches. A couple our same age had died recently at the Queen's Bath on their honeymoon. It gave me the chills hearing about them being swept out to sea when they turned their back to the ocean for a picture. Sitting down for dinner, we had a tasty homemade meal, Matso Ball Soup and flavorful Monchong Fish with Capers. It was a great way to wrap up our last night on the island. 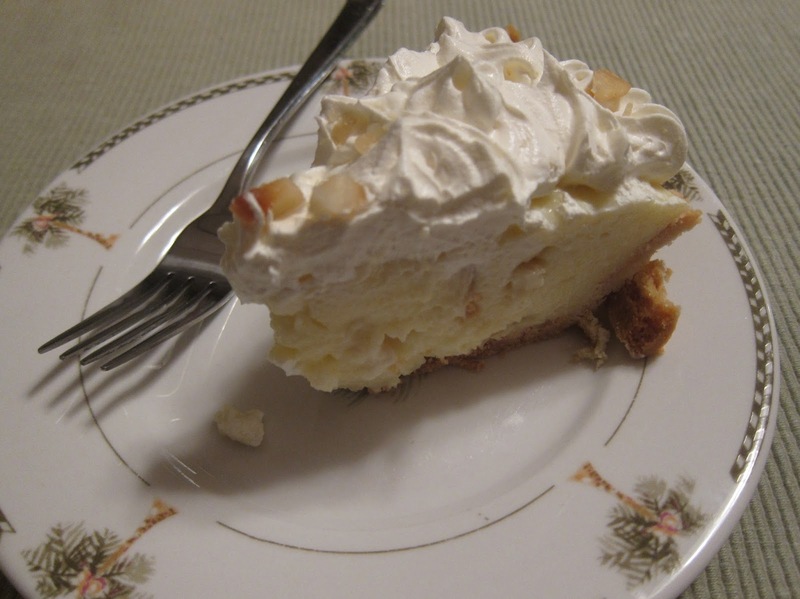 We stayed for a piece of the Macadamia Nut Cream Pie before leaving on our long drive back to Poipu. Our honeymoon over, we flew back to the mainland on Thursday as husband and wife. It was a wonderful trip. I would recommend a destination wedding to anyone.